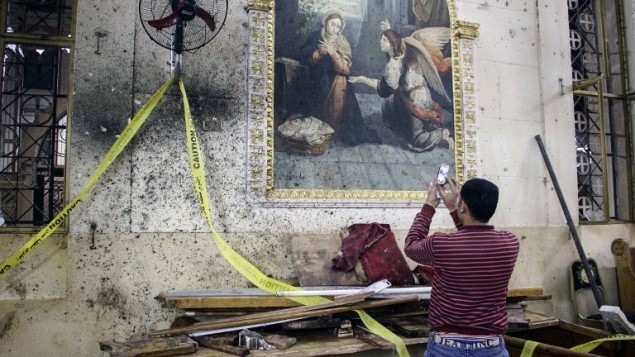 CAIRO — Egypt’s interior ministry said on Wednesday it had identified the suicide bomber behind a deadly attack at the weekend outside a church in the coastal city of Alexandria. The ministry said Mahmud Hassan Mubarak Abdullah had carried out the attack outside Saint Mark’s church in Alexandria on Palm Sunday that killed 17 people and was claimed by the Islamic State group. It said he was born in 1986 in the southern province of Qena and had lived in the province of Suez on the Red Sea. The ministry said it had determined his identity by comparing the DNA of remains found at the site of the bombing with the DNA of "runaway suspects". Abdullah, who had worked for an oil company, was linked to a "terrorist" network, a cell from which carried out a previous bombing of a Cairo church in December that killed 29 people, the ministry said in a statement. It said security forces were "pursuing efforts" to identify a second attacker who targeted another church in the Nile Delta city of Tanta hours earlier on Palm Sunday, killing 28 worshippers. Egypt’s Coptic Church announced on Wednesday that it would cut back Easter celebrations to a simple mass after the bombings.